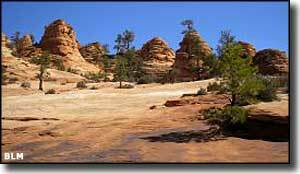 Canaan Mountain Wilderness is comprised of about 44,447 acres of red rock country in southern Utah. Just to the north is Zion National Park (the Zion Wilderness section), to the south is Cottonwood Point Wilderness (in Arizona). 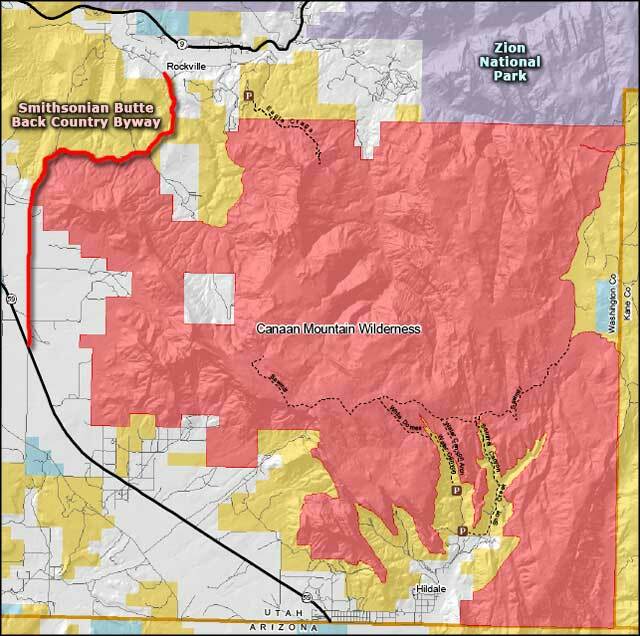 The Smithsonian Butte Back Country Byway winds around part of the northwest boundary. Canaan Mountain is a heavily eroded 8-mile by 10-mile block of Navajo sandstone, bounded by 2,000-foot high White Cliffs. At the base of the White Cliffs are the 500-foot high Vermilion Cliffs of the Moenave Formation. In between is a wide bench of mudstones, part of the softer Kayenta Formation. The landscape is a mix of slot canyons, natural arches, hoo-doos and high vertical cliffs. The very highest areas offer some shade under stands of Ponderosa pines but the lower elevations only offer stunted pinyon pines, Utah junipers, scrub oak and sagebrush. Some of the canyon walls seep water which feeds into small gardens of columbine, maidenhair fern and monkeyflower. There is also enough (just barely) water to support a population of cottontail, jackrabbit, coyote, mule deer, black bear, ring-tailed cat and mountain lion. 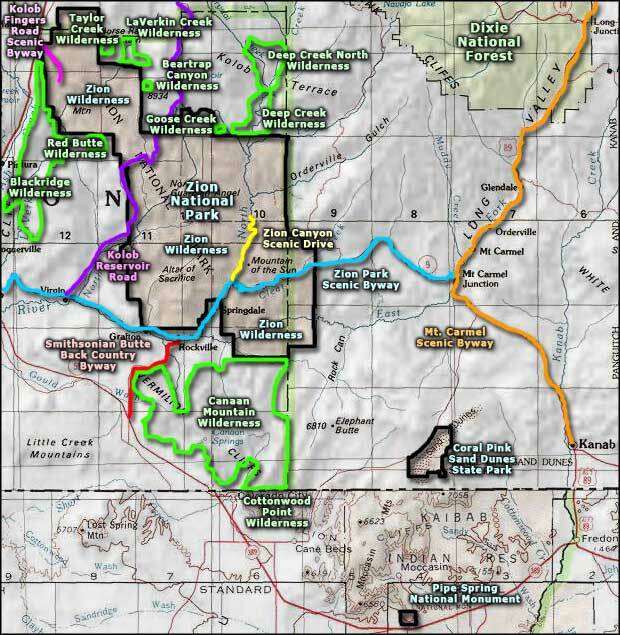 From Hildale at the southern end of the property, there are a couple of access trails that lead to more trails that follow steep canyons up into higher country. The Sawmill Trail is the longest trail on the property, running sort-of east/west along the upper sections of a plateau following an old logging road. The road leads to a logging site on the side of Canaan Mountain where you'll still find a pulley system (for getting logs to the sawmill) and a few collapsed buildings from the days between 1915 and 1928 when a private company was trying to turn a profit logging these woods. The northern section of the wilderness only offers one trail and that trail provides access to Eagles Crag, a 5,200-foot high chunk of spectacular rock. All the routes on Canaan Mountain Wilderness are primitive at best: nothing is maintained and less is marked.